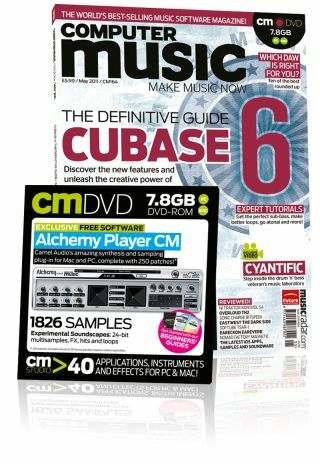 Computer Music 164, May issue – on sale now! The Definitive Guide to Cubase 6! • Master the innovative new features of Steinberg's power-packed DAW with our massive step-by-step guide. • Camel Audio Alchemy Player CM - Amazing synthesis/sampling plug-in for PC and Mac, with 250 patches! • 1826 24-bit Experimental Soundscapes samples. • Check the technique: Start making hip-hop with our no-nonsense guide. • Pitch invasion: Atonal techniques demystified! • The good sub guide: How to get phat, solid sub bass. • In the loop: Make pro-standard loops, with tips from Sample Magic, Loopmasters and Prime Loops. cm164 is on sale now in the UK. Overseas dates are roughly: USA + 4 weeks after UK / Australia +8 weeks / Europe +2 weeks / South Africa +6 weeks / Canada +4 weeks. Alternatively, order online at www.myfavouritemagazines.co.uk.